Drs. Hertzig and Farber provide their readers with the most valuable and groundbreaking studies in child psychiatry before they enter the new millennium. 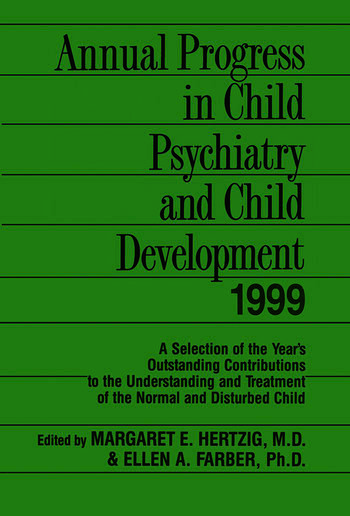 Each article in this 1999 edition of Annual Progress provides clear, concise, and thought-provoking studies on child psychiatry and development. The articles explore developmental issues, clinical problems, and treatment options and procedures. Mental health professionals who work with children and adolescents will find this book invaluable for both its timely information and its long-term reference value. Physical Activity Play: the Nature and Function of a Neglected Aspect of Play, A. D. Pelligrini, and P. K. Smith. Child Development and Emergent Literacy, G. J. Whitehurst, C. J. Lonigan. How Shall We Speak of Children's Personalities in Middle Childhood? A Preliminary Taxonomy, R. L. Shiner. Worry in Normal Children, P. Muris, Ph.D., C. Meesters, Ph.D., H. Merckelbach, Ph.D., A. Sermon, M.Sc., S. Zwakhalen, M.Sc. Children's Recollections of Traumatic and Nontraumatic Events, R. Fivush. Child-Rearing Attitudes and Behavioral Inhibition in Chinese and Canadian Toddlers: a Cross-Cultural Study, X. Chen, et al. A Cross-National Study of Self-Evaluations and Attributions in Parenting: Argentina, Belgium, France, Israel, Italy, Japan, and the United States, M. H. Bornstein, et al. Relationship Between Hunger and Psychosocial Functioning in Low-Income Children, J. M. Murphy, et al. What Matters? What Does Not?, E. M. Hetherington, M. Bridges, G. M. Insabella. Attachment Feeding Problems: a Reexamination of Nonorganic Failure to Thrive and Attachment Insecurity, I. Chatoor, M.D., et al. Psychiatric Illness and Family Support in Children and Adolescents with Diabetic Ketoacidosis: a Controlled Study, D. S. Liss, Ph.D., et al. Headaches and Psychopathology in Children and Adolescents, H. L. Egger, M.D., A. Angold, M.R.C.Psych., E. J. Costello, Ph.D. Course of Tic Severity in Tourette Syndrome: the First Two Decades, J. F. Leekman, M.D., et al. "Multidimensionally Impaired Disorder": Is It a variant of Early-Onset Schizophrenia?, S. Kumra, M.D. Interaction of Temperamental Resistance to Control and Restrictive Parenting in the Development of Externalizing Behavior, J. E. Bates, et al. Longitudinal Study of Co-occurring Psychiatric disorders and Substance Use, J. S. Brook, Ed.D., P. Cohen, Ph.D., D. W. Brook, M.D. Practitioner Review: Psychological and Educational Treatments for Autism, P. Howlin. A Prospective Longitudinal Study of Attachment Disorganization/Disorientation, E. A. Carlson. IQ Decline During Childhood and Adult Psychotic Symptoms in a Community Sample: a 19-Year Longitudinal Study, W. S. Kremen, Ph.D., et al. Cognitive-Behavioral Treatment of School Phobia, C. G. Last, Ph.D., C. Hansen, M.S., N. Franco, Ph.D. What Happens to "Bad" Girls? A Review of the Adult Outcomes of Antisocial Adolescent Girls, K. A. Pajer, M.D., M.P.H.